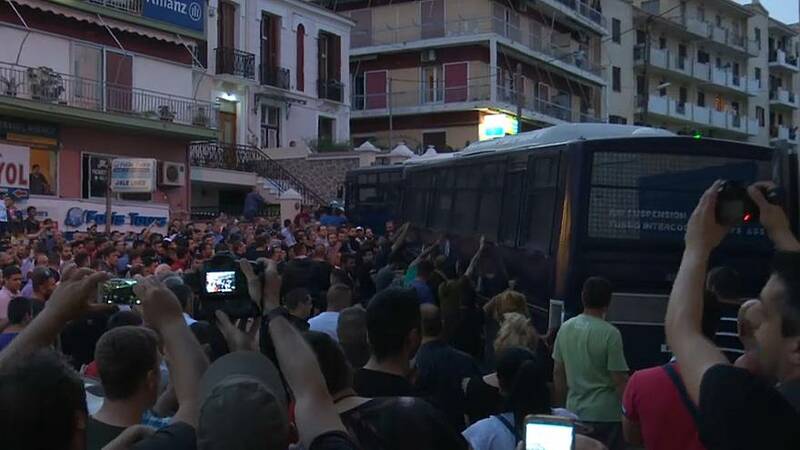 Angry protesters on the Greek island of Lesbos tried to topple a police bus during a demonstration against an EU migration policy which has left thousands of asylum-seekers stranded on the island. The protesters were gathered in the island's main port as Prime Minister Alexis Tsipras is due to speak at a conference. One man questions how the refugee crisis happened. “A few kilometers from here, to the east of Greece, there’s still war going on," says Giannis, a teacher. "And this happens, unfortunately, because war is capitalism’s oxygen”. A general strike on Thursday virtually shut down the island. Under the EU deal, migrants arriving on Greek islands from Turkey are held and face deportation back to Turkey unless they successfully apply for asylum in Greece. Euronews correspondent Panos Kitsikopoulos says people on Lesbos took part massively in the strike sending a clear, strong message that three years after the 2015 migrants 'tsunami', locals don’t want more promises, but concrete moves towards giving support to the island.